“Celebrating Colour in Fibre” was a rare gem of an exhibition and an eye opening experience. 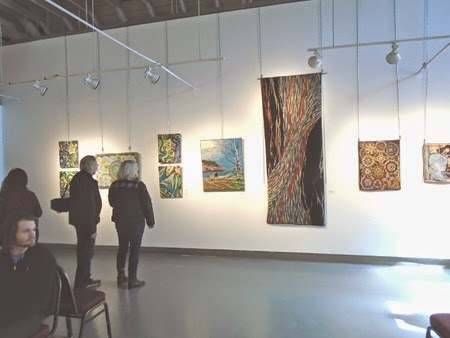 It will have been up for only 12 days when it closes on Sunday March 15 at the Paper Mill Gallery at Todmorton Mills, located on Pottery road, in Toronto's Don Valley. 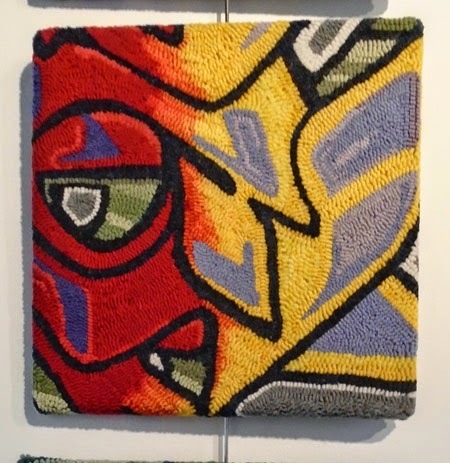 If you miss the opportunity to see this exhibition, you miss an intense presentation showing the beauty of contemporary rug hooking, with imagery ranging from the sometimes photo-realism of Diane Ayles to something like abstract expressionism in the extreme micro close-ups of natural landscapes by Gunda Gamble. This is not what you would expect to see in what people often assume is a quaint traditional folk art/ craft. 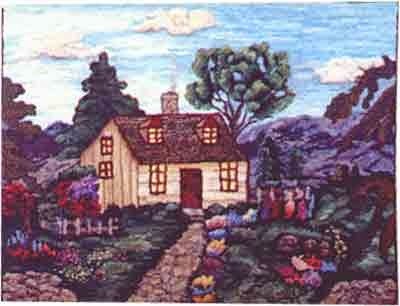 Rug Hooking as a medium of creative expression has a growing number of practitioners, like most fibre-based media. I do not see rug hooking exhibitions that often, but I do see hooked rugs in exhibitions, trade fairs like the “One of A Kind” and the “Interior Design” shows and the many house museums and historic villages I make a habit of visiting when traveling in Canada. 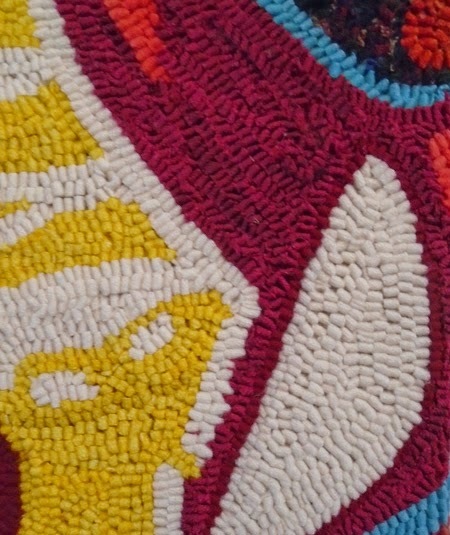 When I saw “Hooked Rugs : Tapis crochetés” at the “Musée des maîtres et artisans du Québec” (a.) in 2008, I saw the work of 4 contemporary rug hookers: Doris Eaton, Dianne Fitzpatrick, Margret Forsey and Rachelle LeBlanc, alongside hooked rugs from the museum's collection. I was impressed by the sameness of them all. Not that the images and patterns were similar, but the technique holds its own no matter who made it or when. While it is not absolutely necessary to have a technical understanding of the creation process or its history in order to have a response to its visual appearance,* in this case, I needed to place this work into its textile context in order to extrapolate on its place within the narrow confines of art. “Tapis crochetés- Hooked Rugs,” exhibition catalogue, image on cover is hooked rug, Québec, end of 19th, beginning of 20th MMAQ 732-1547, Publishers Musée des maîtres et artisans du Québec and Cahiers métiers d’art/Craft Journal, 2008. As a surface decoration technique, (the hooked rugs we encounter are decoration techniques, rather than a construction technique like flat or pile woven or knotted rugs and carpets), it is a relatively new method in terms of when it appears in North America. It is a possible adaption from another known or familiar/ already practised decorative technique, in which a strand of some sort of processed fibre (yarn , strips of torn or cut whole cloth) is passed through or attached to an existing whole woven cloth, from the back to the front, much in the way embroidery is accomplished. Unlike embroidery, the strand is not pulled all the way through, then sent back. Instead, it remains on the back of the cloth with only a loop showing on the top. With the strand being hooked by an implement (a length of wood or metal with a barb/ hook on one end,) being inserted between the gaps in the weave structure of the cloth from the front, the strand is then pulled forward. The natural tension of the cloth is provided by the twist of the fibre from which it is woven. The loops are held in place with no additional anchorage. Many early rugs made with a jute whole cloth, hessian or burlap, provide dating evidence for the period when rug hooking started, since jute cloth began being imported from India into England and then the colonies in the early 19th century. The precise time when rug hooking started in the colonies (in the now north east United States, the Canadian Maritimes and Quebec) is not known. And yet, there is a body of academic research into Hooked Rugs and well-documented collections in a number of museums because collecting hooked rugs as ethnographic/ folk artifacts began in the 1890s. Antique shops and brokers collected samples representing contemporary makers at a time when the origins were within living memory, just 3 or 4 generations away. In fact, the first revival of the craft had already begun a decade earlier. The beginnings of the ongoing revival of lost crafts, which began with the arts and crafts movement, is nearly concurrent with the beginnings of rug hooking. When they ceased being a necessity, their popularity as interior décor waxed and waned over the last hundred years until the DIY movement of the 1990s became yet another “revival.” It is unlikely that the technique will ever be lost, however. The 1937 book "The Hooked Rug" by William Winthrop Kent provides these dates for the classification of /for hooked Rugs in America: Antique 1775-1825; Early 1825-1875, Late 1875-1900, Modern 1900- 1923 and even mentions the difficulty in knowing if some are done from kits. [*2.] We know that burlap (a.k.a. hessian) “was first exported from India in the early 19th century. 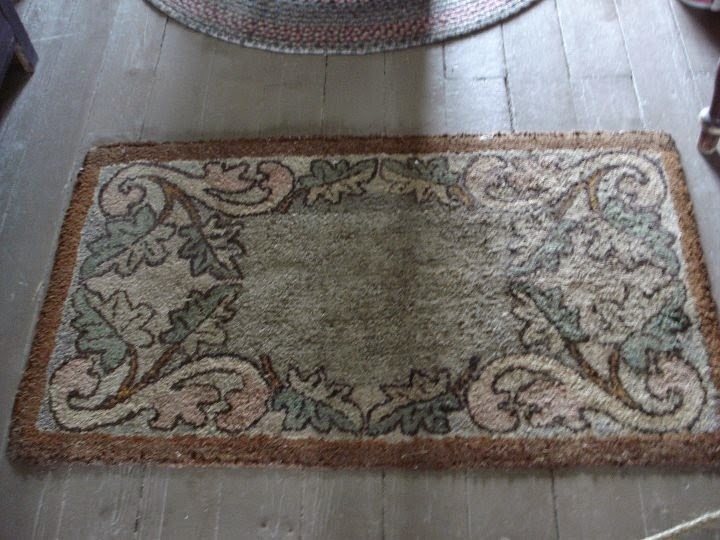 It was traditionally used as backing for linoleum, rugs and carpet” [*3] As a secondary/ recycled backing cloth for rugs the “gunny sacks” used for shipping things like coffee beans and potatoes were plentiful by 1850, which is the middle of what Kent would call the “early” period. His “late” period (1875-1900) is when the roots of what is today's three streams of teaching textile making and embellishing as physical rehabilitation began: hobby guilds, two tiered institutional manual and design education. In the United States, the colonial revival began after the 1876 Philadelphia Centennial Exposition, and while it really was an early interior design fad, it brought about an interest in weaving, braiding and rug hooking, and with it a “how to” industry (there have been at least 5 subsequent "Colonial Revival'' design fads, each occurring after a war or American military action, and the replicas of the first are the antique of the last.) The other aspect of this time period was textile skills education as job creation for the widowed and surplus female population. After the American Civil War, textile skills were promoted in a similar fashion to employment schemes in Great Britain and Canada after the Crimean War, which fed into the arts and crafts movement and the Canadian Handicrafts Guild. One make-work project involved Grenfell Mission, and its production of hooked rugs in Newfoundland and Labrador, in which both physical rehabilitation and income production came together. In 1905, Dr. Wilfred T. Grenfell, who had been working there since 1892, met Jessie Luther (an American woman who had set up a sanitarium with crafts as part of the treatment in Boston in the post Civil war period) and the two of them collaborated on a project that is recorded in the Canadian history books. The commercial mechanism that emerged to encourage the making of rugs as a ‘hobby’ were in place by the early 1900s when you could buy burlap with patterns already printed on it through the Eaton's catalogue, and read articles on how to decorate your home, or join a club or guild (for the more serious minded) . “Hooked rug designs are of two kinds: home-drawn, and commercial patterns. Home-drawn designs were done on the burlap, usually in outline, with ink or bluing. The sources of inspiration ranged from household objects and garden flowers, to magazine and book illustrations. The Royal Ontario Museum even has a rug that was obviously inspired by the White Swan toilet paper trademark. Edward Sands Frost, a Maine tin-peddler, got the idea first in 1864. He cut some tin stencils, and made up a stock of patterns on burlap. Between 1870 and his retirement, six years later, he had cut some 750 plates and was stencilling his burlap patterns in colour. Frost’s patterns are still sold and hooked today. While the makers in this exhibition may or may not have a direct family line to this time period and the locations mentioned above, they do have access to the very organized guilds and all that they provide. I was participating in an event organized by the Hooked Rug Museum of North America in Nova Scotia, that led to these six Ontario-based rug hookers that brought about this exhibition. 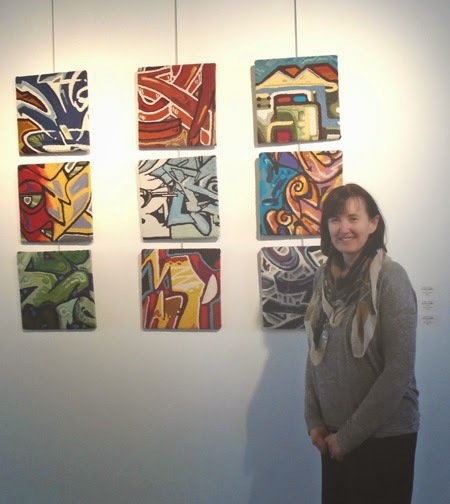 The creative imaginations behind the work in this show are as varied as the work. In his easy “Hooked Rugs and Rural Life in Quebec,” in the “ Hooked Rugs : Tapis crochetés” catalogue Denis Longchamps (current director of the Burlington Art Gallery ) speaks of the makers looking to the flora and fauna of their immediate surroundings for inspiration. [*5] Kathryn Taylor looks to her urban surroundings in her “Toronto Graffiti” series. These 14 X 14 square works of wool on Linen are wrapped on stretchers and presented like paintings and are very much within a group of artists and makers exploring the urban environment and mark-making. They are not graffiti artists themselves, like Jean-Michel Basquiat (and his contemporaries, Keith Haring and Kenny Scharf), whose work came off the outside walls of New York and made it onto the gallery walls. However, their work may in fact be likened to that of Laura Ortiz Vega, a Mexican artist who fuses traditional Mexican artisanal techniques (thread pressed into beeswax on board) with contemporary graffiti imagery that addresses that vernacular. It is work that poses the question: does graffiti mark territory or prove existence? We know there were Vikings in Istanbul during the Viking period because of graffiti. 2. There is also something else going on in cultural display of these two female makers using images of a predominantly male form of mark-making and using what is an assumed to be a traditionally female medium of fibre to create their work. Can you name a known female graffiti artist? There is a further point of interest in Kathryn Taylor's work and that is the removal of function. While you can hang a rug on a wall, you can also take it down and put it back on the floor, but by placing the work on a stretcher she is claiming its right to be observed in the way a painting can be observed, for it to have meaning (outside of a folkloric or ethnological meaning, which can be read on oriental carpets and rugs). This is all supposition on my part, but it is true that a hooked rug allowed me to travel down these different paths making the work exciting. “Chris and Blackie: Summer of 1977,” 2006, Trish Johnson. Photo provided by Trish Johnson. Trish Johnson's family series and her studies in photography and collage at the Ontario College of Art (now OCAD University) come from a very different direction. With the use of overlaying multiple family images and with images of hand written journal texts, maps, and isolating patterns chosen from the wallpapers, and domestic textiles in the family photographs, she has produced an evocative family saga. Johnson made a booklet that gives a biography for each piece in the show, and while it explains her ways of making, and provides details for each piece, it is not necessary to a reading of the story as I read it by the way it was hung. I have to say that I saw the grouping in one room which I took as one work, and then, the other pieces hung, individually or paired, I took as separate works. For the grouping I looked at it as an interactive story board/ post-modern book with hyperlinks, though you have to follow them yourself and find the public part of the story. “Working on the Railroad,” 2012. Trish Johnson. Photo provided by Trish Johnson. “Lighthouses: Douglas at Sallowtail,” 1997 (Grand Manan Island) , “Gannet Rock,” 1998 (Bay of Fundy), “Memories of Oak Point,” 2009 ,(Oak Point, New Brunswick), “My Grandmother’s Diary,” 2003 (Machias Seal Island) . Individual houses: “The W.L. Harvey House” 1996 (Seal Cove, Grand Manan Island), “Grandpa Johnson's House” 1998, “Baby Jean at Aunt Eliza's” 2000, “Memories of Oak Point,” 2009, “Bucknam Benson's House at Seal Cove,” 2014. She uses things that mark time frames (eras). Photographs of family which are generational and dated by the clothing: “Chris and Blackie: Summer of 1977,” “Working on the Railroad,” 2012. With these two element of location and time, she takes you through 100 years of Canadian history and material culture: Industrial history and a story of family migration that follows the employment and the acquisition of leisure time. “Memories of Oak Point,” 2009, in its “Scrap booking” design/ layout of photographs attached at an angle overtop of a map with corner tags screams of the ‘scrap-booking’ trend of the 1980s. I find scrap-booking to be a very intriguing phenomenon, combining printing industry concepts of layout /design for story-telling. Taking influences from paper cutting, découpage, flower pressing, embroidery samplers, and many other supposedly traditional feminine pursuits, and she brings them all together in an Expanded Annotated Book -- both old-fashioned and hyper-new. Granted, it did have a resurgent/ new growth during the 1980s country chic and Victorian decor design craze, and yes, it got extraordinarily commercialized quickly, but as an amalgamation of design ideas and making practices, it is a noteworthy moment in domestic pastimes. While the “Gannet Rock Lighthouse” or “Grandpa Johnson's House” strike me as possibly a mass produced ‘tourist’ or ‘folk-art’ DIY kit designed in the 1920s and available ever since, it is that feeling of familiarity that gives such things their power. It is a power that hooked rugs and many other fibre / textile based works have, to exude “comfort,” allowing the viewer to let their guard down and be taken on a journey that is personal. Contemporary hooked rugs may or may not differ in visual appeal from older rugs, and to assume the older ones lack the stories that the modern ones may carry is a mistake. They are a medium rich in personal expression. “Celebrating Colour in Fibre” was a sumptuous display of skill and individual vision by six very different rug hookers, each deserving a deeper exploration. 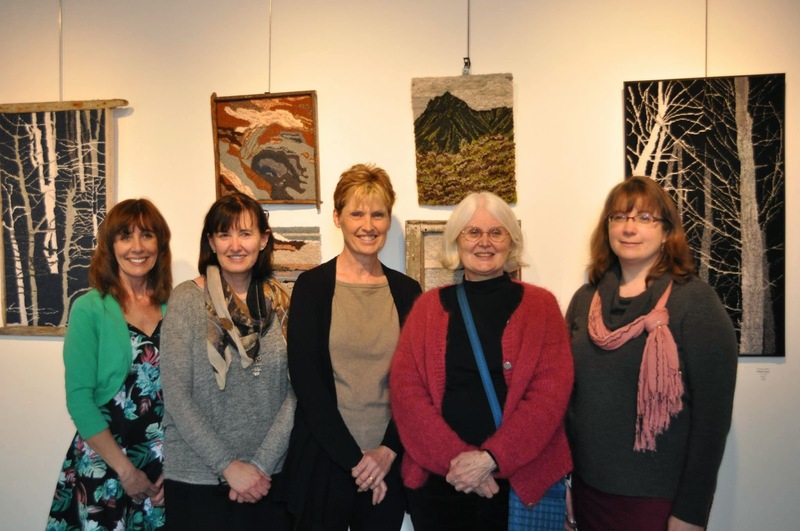 They were: group show: Diane Ayles, Gunda Gamble, Trish Johnson, Karen D. Miller , Kathryn Taylor, and Simone Vojvodin. The exhibition was in the Paper Mill Gallery at Todmorton Mills, a City of Toronto Museum, and ran for far too short a time. March 4- 15 , 2015. The story isn't finished, but the article is. 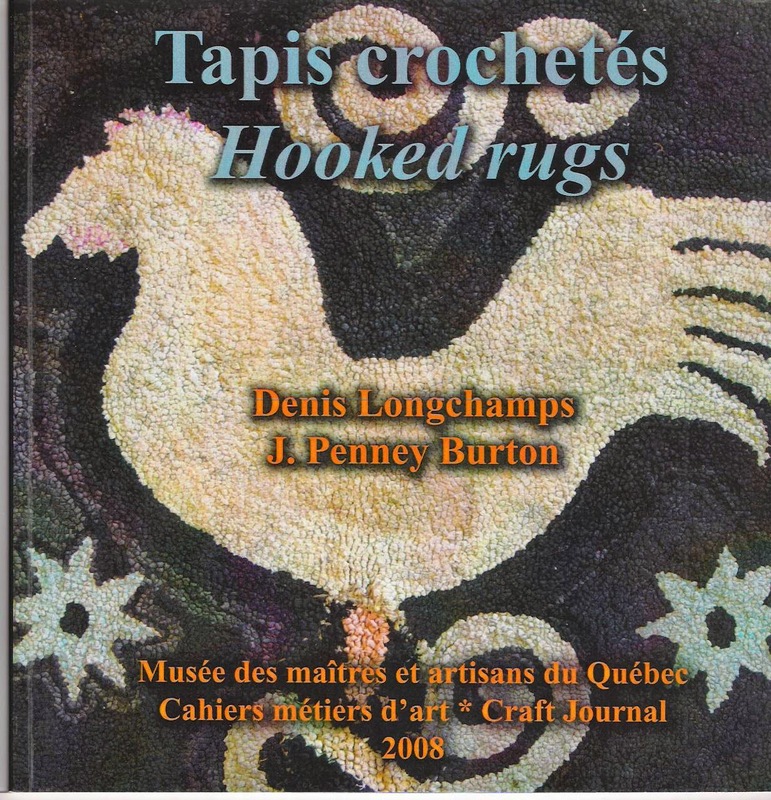 (a) Hooked Rugs : Tapis crochetés Texts by Denis Longchamps and J. Penny Burton, exhibition catalogue, with the Musée des maîtres et artisans du Québec, in French and in English, 2008, 64 pages.